The buck stops with everybody. This week’s featured post is “My Wife’s Expensive Cancer Drug“. Because in America, medical stories are never just about medicine. They’re also about money. Namely: the partial government shutdown and the Wall that is the central bone of contention. On December 19, the Senate passed a continuing resolution with $1.6 billion for border security, but stipulated that it not be used to build walls in places that did not already have them. This was a bipartisan compromise that went through by voice vote, and Senate Republicans believed Trump would sign it. Trump then demanded an additional $5.6 billion for the Wall, offered Democrats essentially nothing in exchange, and the government shut down on December 22. The situation hasn’t really changed in the 3+ weeks since. Trump’s “negotiating” has amounted to repeating the same demands and lying to the public about the consequences of having or not having a southern border wall. (Not only are the problems Trump points to vastly overblown, but a wall would do very little to solve them.) Meanwhile, he torpedoes any effort by Republicans in Congress to come up with an offer the Democrats might consider. The Democrats’ position hasn’t changed either: Most of the departments that have been shut down have nothing to do with border security or the Wall, so why not just re-open them? (If you’re a soybean farmer in North Dakota waiting for a subsidy check to make up for the Chinese exports you lost in Trump’s trade war, the Wall has nothing to do with you. So what sense does it make to leave the Department of Agriculture closed?) 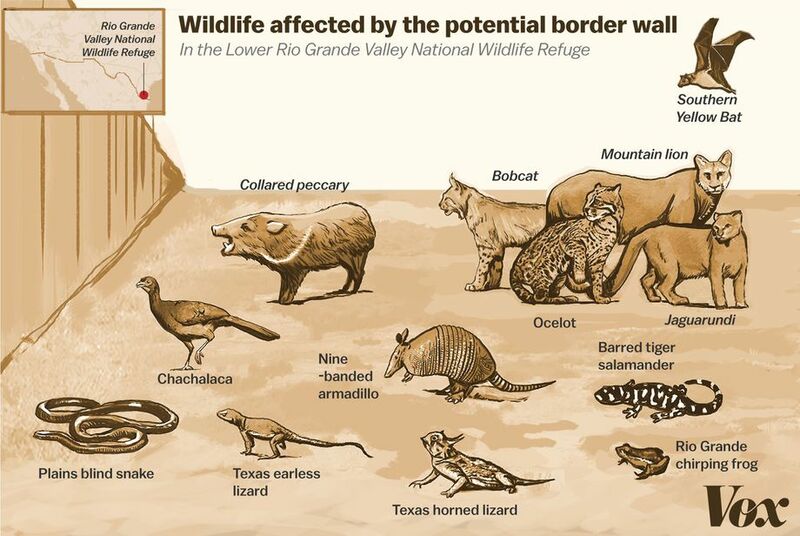 On the substance of the issue, Democrats believe the Wall is a silly waste of money, not to mention being an environmental disaster and a symbolic declaration that brown people aren’t welcome here. If you can delay it, schedule it, or decide later whether or not it exists … it’s probably not an emergency. I said last week that I thought using an emergency declaration to circumvent Congress’ constitutional powers would be an impeachable offense. Frank Bowman discusses that possibility on Slate. It’s complicated. Usually, the emergency declaration is presented as a way that Trump can allow the government to re-open without seeming to have “lost”. (The conflict would then move to the courts, where Trump would probably lose.) But Friday White House officials were floating the idea that Trump might declare an emergency to build the wall and then keep the government closed. Trump’s allies say the president is reluctant to hand Democrats a “win” by reopening the government after he’s invoked emergency powers. They claim that in such a scenario, Trump’s political opponents would avoid making a single concession and potentially score a major victory if the administration were to lose in federal courts as many legal experts predict. “He could say, ‘Look, I’m going to get what I want and then I’m still going to screw you,’” a former White House official told POLITICO. “It’s making Democrats feel pain instead of declaring a national emergency, opening the government up, and making it so they don’t have to give anything,” the former official added. Because it’s never about what’s best for the country. It’s about winning and making your enemies feel pain. Everybody’s wondering how this ends, and the only possibility I can see is that Trump’s support in the Senate crumbles. I can’t guess how long it will take for that to happen. There is precedent for networks refusing a president’s request for airtime: They rejected Obama’s request to speak to the nation about immigration in 2014. I find it worthwhile, if a bit depressing, to compare Trump’s speech to Obama’s. Not so long ago, we had a president we could respect, who talked to us as if he and we were all adults. 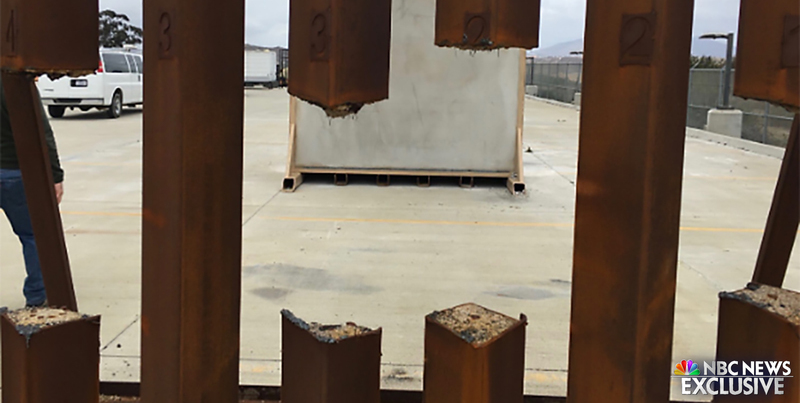 The steel-slat design for the Wall is maybe a little less impenetrable than Trump lets on. This hole was made with an industrial saw. A furloughed worker at the National Gallery describes his first week of idleness. Apparently, Robert Mueller inherited that counter-intelligence investigation when he got appointed special counsel. … As a result, U.S. officials said there is no detailed record, even in classified files, of Trump’s face-to-face interactions with the Russian leader at five locations over the past two years. Such a gap would be unusual in any presidency, let alone one that Russia sought to install through what U.S. intelligence agencies have described as an unprecedented campaign of election interference. … Senior Democratic lawmakers describe the cloak of secrecy surrounding Trump’s meetings with Putin as unprecedented and disturbing. I can’t think of any innocent explanation for this. Saturday, Fox News’ Jeanine Pirro asked Trump whether he is or ever has been working for Russia, he replied “I think it’s the most insulting thing I’ve ever been asked.” That, you may note, is not a denial. Max Boot lists 18 reasons to think that Trump might be a Russian asset. These revelations follow what we learned Tuesday: That when he was running Trump’s campaign, Paul Manafort was sharing the campaign’s polling data with Konstantin V. Kilimnik, who is widely believed to be a Russian intelligence agent. Thursday, Treasury Secretary Steve Mnuchin gave a classified briefing to Congress about his department’s decision to relax sanctions against companies owned by Russian oligarch Oleg Deripaska. Speaker Nancy Pelosi of California called the presentation “one of the worst classified briefings we’ve received from the Trump administration” and accused Mr. Mnuchin of “wasting the time” of Congress. She said Mr. Mnuchin was unresponsive to important questions. … Representative Brad Sherman, another California Democrat, said he opposed easing the sanctions because it would only increase the wealth of Mr. Deripaska. He said Mr. Mnuchin had no response to that argument except that lawmakers should trust the administration. Julián Castro is running. Tulsi Gabbard is running. Kamala Harris is saying “I might“, which sounds a lot like “I will” at this stage. The media continues to cover Trump’s insults as if they were news. Just today, the Washington Post made a headline of Trump’s “trash heap” comment on Joe Biden, and of his “Wounded Knee” reference in a tweet about Elizabeth Warren. I can’t find any other coverage of Biden or Warren in the WaPo today. Apparently, journalists learned nothing from 2016. Here’s one typical of the type, from Politico: “Exasperated Democrats try to rein in Ocasio-Cortez“. Guess what? Not all Democrats are as liberal as Alexandria Ocasio-Cortez, and the ones who don’t agree with her wish she’d get less attention. She got her seat by beating an incumbent Democrat in a primary, and she thinks other progressives should try to do the same thing, particular if (like her) they come from a district that is more liberal than the Democrat representing it. Democrats who aren’t as liberal as their districts hope she doesn’t support their challengers. None of that should be surprising, and it’s hard for me to see why it’s newsworthy. But I think we’re going to see a lot of articles like that, for a simple reason: Conflict is easier to cover than governing. Reporters at places like Politico would rather write Democrats-are-fighting-each-other stories than Democrats-are-working-on-legislation stories. Politico reporters and their ilk are like the village gossip, who gets attention by asking “Did you hear what so-and-so said about you? What do you think about that?” and then taking your response back to so-and-so and doing the same thing. That kind of reporting doesn’t require the reporter to learn anything about climate change or immigration or any other substantive issue. The resulting article doesn’t have to make government or the legislative process interesting to its readers. Instead, political reporters get to write about conflict and manipulate their readers’ outrage. If you don’t like AOC, you read the Politico article and think “Who does she think she is?” If you do, it’s “Why can’t jealous Democrats do their own jobs and get off her back?” Meanwhile, you’ve learned nothing about the country’s problems or how Democrats in Congress are trying to address them. Later, reporters will talk to the same citizens they have failed to inform, and write about how people don’t think Democrats are doing anything. I think we should ignore them. Christians never stop trying to use tax money to promote their religion. In Florida and North Dakota, the legislature is considering bills to force school districts to offer courses on the Bible. In Kentucky, such a bill has already passed, but the curriculum hasn’t been implemented yet. This is yet another example of the hypocrisy in the conservative value of “local control”. Why can’t communities decide for themselves whether or not to offer such courses? Constitutionally, the line is pretty clear for people who want to understand it: It’s legal to teach about religion in public schools, but illegal to teach religion. The difference is simple. If the teacher says, “Most Christians believe that Jesus rose from the dead”, that’s OK. If the teacher says “Jesus rose from the dead”, that’s not OK.
“Trackdown” aired on CBS between 1957 and 1959 and took place in Texas following the Civil War. The series followed Texas Ranger Hoby Gilman, played by Robert Culp, on his adventures protecting the people of the Lone Star State. The 30th episode of the show, titled “The End of The World,” premiered on May 9, 1958, and saw a con man named Walter Trump, played by Lawrence Dobkin, attempt to scam the entire town. The fictional Trump warned the Texans that apocalyptic meteors would strike the town at midnight, but he could protect everyone. … His solution was to build a wall made of magical metal that would repel the meteors and keep everyone safe. The full episode is on YouTube. I think there was another one but I can’t find it now. Great posts, both. Sorry to hear about your big pharma nightmare. I’m 65 and not on any drugs so far, knock wood. Thank you. I hope your drug-free health continues.